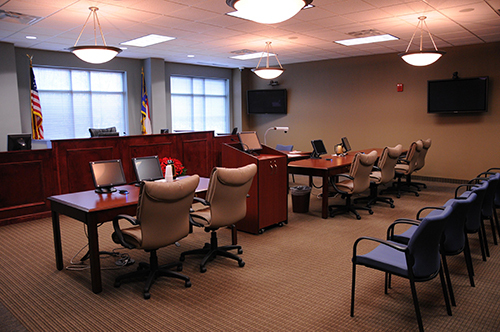 Courtroom facilities in Raleigh are located within the OAH offices at 1711 New Hope Church Road. There are four courtrooms, two large (A and B) and two small (C and D). These courtrooms are equipped with the additional support equipment described below. The equipment and functionality listed below may not be available at all times and hearing participants must be prepared to conduct the hearing without any support equipment. Hearings in locations outside of Raleigh do not provide any additional support equipment. Do not bring food or drink into the courtroom. OAH will provide a copy of the audio recording of a hearing at cost when requested. The form to request a copy of the audio recording of a hearing (H-25B Hearing CD/DVD Request Form) can be found on the Hearing Forms page. Hearings are recorded in digital format. Copies of the recording are available after the hearing and may be requested by filling out the applicable request form on the Hearing Forms page. Information regarding the cost of audio recordings is available on the OAH Costs and User Fees page. The digital recorder is located at the Hearing Assistant’s portion of the Judge’s bench and is monitored by the Hearing Assistant. Microphones are located at the Judge’s bench, witness stand, presentation stand, and participants tables. Microphones are powered by the digital recorder, and the participant microphones have a blue LED when active. These microphones can be muted by pressing the touch pad near the blue LED (the LED goes off when muted). The other microphones are always active. The sound from the microphones is output over the ceiling speakers, along with any sound from the telephone conferencing equipment and the user-supplied laptop, as well as the VHS/DVD player and videoconferencing equipment in Courtroom A or B. The volume level, muting, and on/off is controlled by the Judge at the Judge’s control panel. A multi-party telephone conference can be set up and controlled by the Hearing Assistant at the Hearing Assistant's control panel. The remote parties will be heard over the ceiling speakers, and the local parties will be heard through the courtroom microphones located at the Judge’s bench, witness stand, presentation stand, and participants tables. Dialing, volume, and disconnect are controlled by the Judge at the Judge’s control panel. The heating and air conditioning system is controlled by a central computer program. The settings are 70°F heating and 76°F cooling. Thermostats are located in each courtroom; however, changes to standard settings must be made by OAH staff. Presentations from VGA video sources can be viewed on computer monitors located at the Judge’s bench, witness stand, presentation stand, and participants tables. Presentation sources include user-supplied laptop or other user-supplied device with a standard computer VGA video output. Connections for laptop input into the audio recording and video presentation system are available at the podium or participants tables. Video connection is a 15-pin male VGA connector, and audio connection is a male mini-stereo connector. These are standard connectors that plug into the external video monitor and external headphone connectors on a typical PC laptop. OAH does not provide laptops or computer hardware for presentations. A small number of computer video cards have been found to be incompatible with the video display system. Additional presentation features are available in Courtrooms A and B only. These include touchscreen monitors at all locations, including the podium, with on-screen annotation; large wall-mounted plasma screens; and document camera, VHS/DVD player, and videoconference display sources. Two (2) copies of electronic presentation material must be provided to the Hearing Assistant in acceptable format – Microsoft Office or Adobe PDF for presentations, Windows Media Format for video, JPEG for pictures, and WAV or MP3 for audio. Judicial preview and full room presentation are controlled by the Judge at the Judge’s control panel. A VHS/DVD player is located in the shelf under the presentation stand. The player is compatible with full-size VHS cassette tapes, audio CDs, and video DVDs in most standard formats. The player can be controlled manually from the front panel controls or remotely by the Judge’s control panel. The remote control does not provide feedback to the Judge’s control panel so remote control actions may not always be activated properly. OAH recommends transferring audio and video content onto a PC and displaying the content using the laptop interface described above instead of using the VHS/DVD player. This will eliminate format compatibility issues with the player and allow user control of the content presentation. A fixed document camera is located at the presentation stand. The camera stand can accommodate paper sizes up to 12” x 17”. The power button is located in the camera base--red when off and green when on. Hold the button down until the LED changes to red when powering off. The camera swivels in multiple directions so a three-dimensional object can also be displayed. A camera light switch is located near the camera lens for extra illumination, and the camera has zoom and autofocus controls located at the end of the camera arm. Display monitor screens at the Judge’s bench, witness stand, presentation stand, and participants tables are touch-sensitive and can be used to annotate over a displayed image. All monitor screens are active and can erase or overwrite any other monitor’s annotation. The color control will change the line or arrow color as selected (white, black, pink, red, green, yellow, and blue). Existing annotations stay their original color. The clear control will remove all existing annotations on the screen. The undo control will remove each annotation, starting with the most recent, one at a time. A videoconference can be set up and controlled by the Judge at the Judge’s control panel. The conference equipment must use the standard H.323 videoconference protocol at each end. Due to the large variation in videoconference equipment, proposed conference calls to a new endpoint must be tested and verified prior to scheduling. If you wish to have a videoconference and the Judge has approved the request, you are strongly encouraged to schedule a test at least 1 business day before the scheduled videoconference. To schedule a videoconference test, please contact the Judge's paralegal and let him or her know that you would like to schedule a videoconference test. Generally, the Business Operations Coordinator will conduct videoconference tests, but the Judge's paralegal should be contacted to confirm that the Judge has approved the videoconference request and to facilitate communication between you and the Business Operations Coordinator. Any fees associated with a videoconference must be paid by the requesting party. In the courtroom, the video originating outside OAH will be displayed on two large wall-mounted plasma monitors. The local video view can be selected by the Judge from preset views or adjusted manually from the Judge’s control panel. The local view can be displayed on the plasma displays using the small PIP overlay. Local video source can be either of two courtroom video cameras or any presentation source (laptop, document camera, or VHS/DVD player). The remote parties will be heard over the ceiling speakers, and the local parties will be heard through the courtroom microphones located at the Judge’s bench, witness stand, presentation stand, and participants tables. Connection, camera views, volume, presentation source, and disconnect are controlled by the Judge at the Judge’s control panel. If you would like to arrange a familiarization session and your hearing in scheduled in one of OAH's Raleigh courtrooms, contact the Clerk's Office at least one week before your scheduled hearing date (919-431-3000).